"This easy, filling meal uses lots of fresh vegetables, and some frozen or canned to make it easy. Ground turkey breast can be added for meat lovers. Serve over wild rice with shredded cheddar cheese, or with tortilla chips. " If using turkey, heat oil in a large saucepan over medium-high heat, and cook and stir the ground turkey for about 10 minutes, breaking it up with a spoon as it cooks, until the meat is no longer pink. Remove the turkey meat and set aside, leaving oil in the pan. Place the onion, green peppers, and carrots into the saucepan, and cook and stir for about 10 minutes, until the onion is translucent and the vegetables are tender. 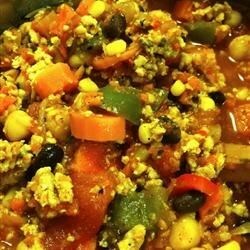 Stir in the chili powder, cumin, and black pepper, and pour in the diced tomatoes, frozen corn, black beans, garbanzo beans, and chicken broth. Bring the mixture to a boil. Place about 1 1/2 cups of the chili mixture into a food processor, and puree for about 1 minute until smooth. Pour the puree back into the rest of the chili to thicken. Add the cooked turkey meat, and bring the chili back to a simmer over medium-low heat. I doubled the recipe for everything except the turkey. This is great! I did not puree the mixture because I like the chunks of beans, meat and veggies! I love how vivid all the colors are! Five stars good flavor, simplicity and nutritiously healthy. I did not have corn or green pepper whcih could only improve it in my opinion. Made this a couple of times and both times came out amazing. I doubled the cooking time and used vegetable stock instead, obviously omitting the turkey. This was delicious. I only changed two things in this recipe. I added 4 diced (seeded) jalapenos. I also used a bag of dried mixed beans instead of canned black and garbanzo beans. Wow! So great! I doubled the chili powder and added 1 tablespoon of garlic salt and 1 tablespoon of red chili flakes. Boyfriend approved!